UNITED NATIONS, Sep 10 2014 (IPS) – If a Silicon Valley existed for the culture of peace, it would most likely look to global citizenship as the next big industry shake-up. 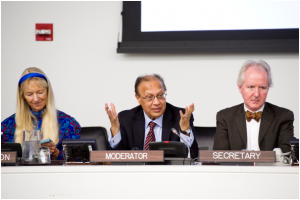 “Global citizenship, or oneness of humanity [is] the essential element of the culture of peace,” Ambassador Anwarul Chowdhury, former under-secretary general and high representative of the U.N., told IPS on the sidelines of the General Assembly’s High-Level Forum on the Culture of Peace Tuesday. The day-long forum included panel discussions on global citizenship and the contributions of women and youth to a nonviolent world community. Ambassador Chowdhury took the lead in putting the culture of peace on the U.N. agenda in the late 1990s. The culture of peace concept was evolving in the U.N. Educational, Scientific and Cultural Organisation (UNESCO), but Chowdhury felt that it deserved to be discussed at an even higher level. The U.N. needed “to shift gear” away from peacekeeping operations “to focus on individual and community transformation,” Chowdhury told IPS. In 1999, at the urging of Chowdhury, the General Assembly (GA) passed the milestone Resolution 53/243 on the “Declaration and Programme of Action on a Culture of Peace.” The resolution asserts that a culture of peace is a way of life based on non-violence, territorial integrity, human rights, the right to development, freedom of expression and the promotion of equal rights for women and men. Article 4 of the resolution makes clear that “Education at all levels is one of the principal means to build a culture of peace.” Governments, civil society, the media, parents and teachers are all called upon to promote a peaceful culture. The 1999 resolution also led to the observance from 2001 to 2010 of the U.N. International Decade for Culture of Peace and Non-Violence for the Children of the World. While its official decade may be over, the culture of peace continues to be relevant 15 years after Resolution 53/243 was adopted. Each year, the GA adopts a resolution reaffirming the commitment of member states to building a culture of peace. This year’s all-day event built on the success of two past high-level forums in 2012 and 2013, giving member states, U.N. entities and civil society a chance to exchange ideas on how to best promote nonviolence, cooperation and respect for all. Secretary-General Ban Ki-moon kicked off the day with an endorsement of the culture of peace. “We need new forms of cultural literacy and diplomacy, between societies and within them,” he said. “We need educational curricula to deepen global solidarity and citizenship. Interactive panels focused on the keys to attaining a culture of peace. Lakhsmi Puri, Deputy Executive Director of UN Women, highlighted the role of women in building and sustaining the culture of peace. Women “must be seen as agents of conflict prevention,” she said. Women should bring their leadership and solutions to the peacemaking table, according to the panellists. The youth population is also crucial to making a culture of peace a reality. Kathleen Kuehnast, director of the Centre for Gender and Peacebuilding at the U.S. Institute of Peace, received a round of applause when she proposed a new perspective on the culture of peace, invoking the analogy of creative, high-energy entrepreneurship. Dot Maver, president of the New York-based National Peace Academy, identified emerging trends and concepts that herald the rise of global citizenship, such as the sharing economy, the global commons and bioregional dialogues. While the U.N. is a strong supporter of global citizenship and the culture of peace, it could do a much better job of spreading the message, according to Ambassador Chowdhury. Throwing money at educational infrastructure will not be enough, Chowdhury said, because there is no guarantee that it would go toward the right type of education. The U.N. must work more with communities and societies to build education systems that teach young people to be citizens of the world. Supporters of the culture of peace hope that the energy and ideas from Tuesday’s high-level forum will spread the message of global citizenship to the human community, leading to a true transformation.